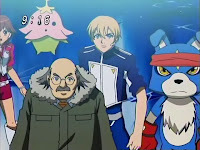 Digimon: System Restore: Data Squad Episode 18: The Clash With Merukimon! This is the part of the show where the good guys storm the castle, reach the boss and finally throw down after all the agonizing set up. There's always some sort of pregame smack talk but nobody ever pays it any mind. 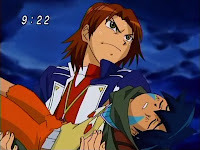 Even when the bad guy's situation is more complex than expected (and starting with the Digimon Emperor, it almost always is), it still ends up in a fight. Hearing the enemy's side of the story may be provocative or interesting, but it rarely changes any minds. That's why it's jarring for the Data Squad to come all this way to confront Merukimon, only for him to point a finger back at them and say the humans started it. Even without knowing whether he's right or wrong, it's a twist on expectations. Merukimon looks like a bad guy. He's as powerful as a bad guy. His lieutenants range from vengeful to legitimately psycho. So it's hard to imagine a battle with him being prefaced by him and Homer trying to deflect blame on each other. It wasn't even terribly hostile considering the circumstances. Despite their disagreement, Merukimon and Homer seem to have a degree of respect for each other, even as Merukimon's making the argument that the invading humans need to die. The real kicker is how murky the truth is. From Sampson's explanation, it's easy to believe that the whole thing's a misunderstanding. The party entered to investigate with no malice, but probably had plenty of self-defense options. Yet some of the specifics Merikimon brings up seem hard to lie about. According to him, humans violated a treaty and killed Digimon. This included Frigimon, who never regenerated. This led to the awkward case of humans trying to convince Digital World denizens that dead Digimon always regenerate. Uh... Merukimon knows this. This ain't Tamers. He said it anyway. Actually, Homer's mysterious enough on his own. He can pop into the Digital World to meet up with the Data Squad, who all went through hell to get to the same place. He's close to/part of the original party and knew Spencer Damon. He has his own digivice, Digimon and the ability to evolve him! For all the mysterious old man cliches you can come up with, giving him that is insane. And yet, while newbie Marcus accepts him with open arms, it's experienced members Thomas and Yoshi that are suspicious of him. That should raise some red flags; if Homer really is a respected member of DATS, you'd think they'd have seen him around the office. By the time you add Keenan and Gotsumon to the picture, the episode ends up being jam packed and almost a little cluttered. Merukimon plays Keenan masterfully, calling Keenan a Digimon warrior, thereby sparing him the need to actually call him a Digimon. Keenan continues to attack, but his hatred of humans clearly pales in comparison to that of Gotsumon, who'd just assume kill everybody in the room. While Keenan and Falcomon use direct, honorable combat, Gotsumon blows the whole damn place up, unconcerned about who's friend or foe. He's the nastiest character we've met so far and we really should find out why one of these days. As a result of Gotsumon, Marcus and Keenan end up separated. Marcus appears to take care of Keenan throughout the ordeal out of human decency, but after this we aren't entirely sure if we trust the concept of human decency. Marcus ends up protecting Keenan because they haven't properly settled their fight. So yeah... while we aren't sure whether or not we can trust the humans that first entered the Digital World, our first exposure to The Marcus Code just did Keenan a solid. After the collapse, Yoshi wonders how she's uninjured. That's actually a really good question, and downright meta considering she and Thomas should have been pulverized. In their own ways, Falcomon and Merukimon are both much less hostile than they'd seem, between Falcomon trying to suggest the possibility of good humans and Merukimon's actions coming out of paternal instinct rather than aggression. Boy, ever since Frontier really sold the idea of combining attacks, everybody wants in on the bandwagon! Kamemon's entrance into the foray is perfect, particularly Yoshi's reaction at seeing him on the battlefield. Yet while Gwappamon is totally rad and all, it doesn't seem like a great choice to be an old man's partner. It really is unbelievable that Gotsumon is the most menacing presence in this whole thing. Frigging Gotsumon! Even if he runs into Merukimon's throne room, screaming in panic that somehow, the in-training digimon didn't slow the heroes down. Also good was the smoke clearing and Merukimon kindly reminding everyone in the room that he's a goddamned Mega. There's a reason why Gotsumon keeps appearing in every Digimon season. Except Tamers. I don't remember seeing a Gotsumon there, unless he was one of IceDevimon's victims. Certainly not as an actual character. 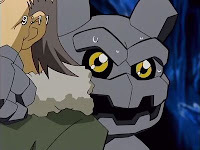 I think it is actually kind of nice that we don't get a real concrete reason on why Gotsumon is such a jerk. You get the generic "Humans invaded and killed us" but I don't remember it really going farther then that. I think Savers really shows us that some Digimon and some Human are just not nice or moral creatures. Sometimes scumbags just exist with no real back-story to validate their horrible actions. It really helps to project the theme of prejudice in the show. Some humans are just evil. Some digimon are just evil. Still doesn't give ether side the right to genocide the other. I heartily agree, and if anything I find it a bit wearisome that people think there has to be a "reason" others turn out to be jerks, as though they had to be bullied as kids or had parent issues. It's almost like denial, as though they just can't accept that some people are born jerks and stay jerks even despite having no better or worse lives than anyone else. Gotsumon didn't need a reason to be a cowardly jerk. He just needed an excuse. Even when he's reborn later on in the series, he's still a bit of a cowardly jerk. Not trying to be rude here, but its "just as soon as" not "just assume".